LAB2 : COMBINATIONAL SYSTEM DESIGN USING DATA FLOW MODELLING STYLE. Lab Exercise 2a :: VHDL with Naresh Singh Dobal Learning Series. Lab Exercise 2-b :: VHDL with Naresh Singh Dobal Learning Series. Task1 : Write a VHDL code for all gates using with-select. Task2: Write a VHDL code for Full adder using with-select. Task3: Write a VHDL code for Full subtractor using with-select. .
Task4: Write a VHDL code for 4:1 Multiplexer using With-select. Task5: Write a VHDL code for a 1:4 Demultiplexer using with-select. Task6: Write a VHDL code for a 8:3 Encoder using With-Select. 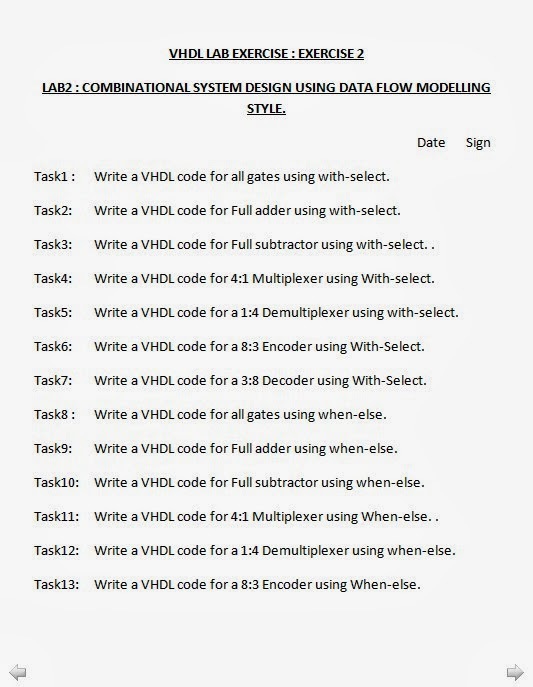 Task7: Write a VHDL code for a 3:8 Decoder using With-Select. Task8 : Write a VHDL code for all gates using when-else. Task9: Write a VHDL code for Full adder using when-else. Task10: Write a VHDL code for Full subtractor using when-else. Task11: Write a VHDL code for 4:1 Multiplexer using When-else. .
Task12: Write a VHDL code for a 1:4 Demultiplexer using when-else. Task13: Write a VHDL code for a 8:3 Encoder using When-else. Task14: Write a VHDL code for a 3:8 Decoder using When-else. Task15: Write a VHDL code for 8:3 Encoder with Priority using when-else. Task16: Write a VHDL code for BINARY to GRAY Converter using with-select. Task17: Write a VHDL code for GRAY to BINARY Converter using with-select. Task18: Write a VHDL code for BINARY to GRAY Converter using when-else. Task19: Write a VHDL code for GRAY to BINARY Converter using when-else. Task20: Write a VHDL code for BINARY to EXCESS-3 using With-select. Task21: Write a VHDL code for BINARY TO GRAY Converter using equation. 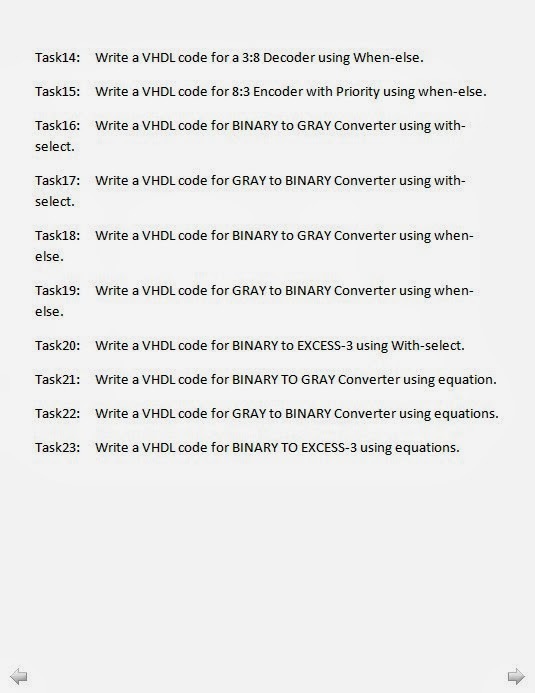 Task22: Write a VHDL code for GRAY to BINARY Converter using equations. Task23: Write a VHDL code for BINARY TO EXCESS-3 using equations. Solutions for problems in with-select statements. Solution for problems in when-else statements.